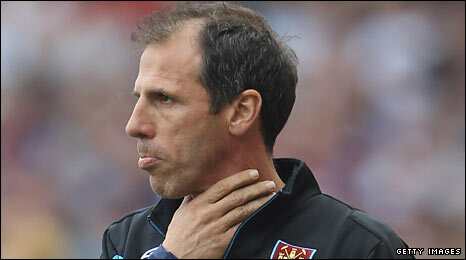 Gianfranco Zola has agreed a compensation settlement with West Ham United following his sacking in May. The Italian was relieved of his duties as manager following a poor Premier League season and replaced with former Portsmouth boss Avram Grant on 3 June. "I will always be very grateful to the club for giving me the opportunity to manage in the Premier League," said Zola, 43, in a statement. 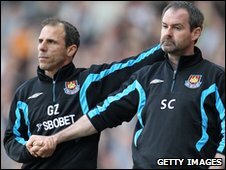 Zola's assistant Steve Clarke has also left the club by mutual consent. Zola took over at Upton Park following Alan Curbishley's resignation in September 2008, guiding the club to an impressive ninth place in the Premier League. Have Zola and Clarke ultimately been let down by West Ham? He signed a four-year deal with the Hammers in April 2009 reported to be worth £1.6m a year but only just managed to keep his side in the Premier League last season, with the Hammers finishing one place above the relegation zone. The former Chelsea favourite still had three years to run on that deal when he was sacked by West Ham owners David Sullivan and David Gold, who took over at the start of the year. However, the ex-Italy striker has negotiated a settlement with the assistance of the League Managers' Association. "I would like to offer my sincere thanks to all of the players, staff and fans who supported me so well during my time at the club and I wish them every success for the future," added Zola. "I would also like to thank the LMA for their support and hard work during the difficult period of my contract termination process. "I am looking forward to finding a new challenge in the game and returning to management as soon as possible." A statement from West Ham read: "West Ham United would like to thank Gianfranco Zola for his efforts during his time at the club. "We would like to thank both him and the LMA for their professionalism in reaching a satisfactory settlement and we wish Gianfranco well for the future." Gold said: "I'm delighted we've managed to come to an agreement with Franco. "I really do wish him the very best of luck. He's one of the nicest people in football that I have worked with and I'm sure he's got a future in management at the top level. "He has a style which suits certain clubs and I am sure that we'll see him about in football in no time at all." Clarke, who arrived as first-team coach arrived in September 2008, said: "I have enjoyed my time at West Ham. "I was looking for a fresh challenge in football before I arrived and certainly got that. "It was a good experience which will help me in the future. I would particularly like to thank the fans for all their support and the players and staff for their efforts. "I will follow the club's progress with interest and I am sure, with the new stability off the pitch, that the team will have every opportunity to do well next season."